The growing unrest in Pakistan is raising many alarming questions about the integrity of this troubled Islamic Country. Recent development in Swat region and the restoration of “System of Justice” or in local language “Nizam-e-Adal” brought some satisfaction to the residents of this area who witnessed the development with a hope that peace would return soon. Unfortunately after some days fake video clips started pouring in the international media and most unfortunately these reports were not verified by any responsible media people before airing them and using them as tool to trigger negative propaganda to sabotage the deal between ANP Government and the Local Talibans. It is bad luck of the people of Swat that their happy days could hardly see some stability. One can witness that no body is ready to rescue them from the ugliest situation but are pointing fingers about the agreement between Taliban and the Government of the Frontier Province. In the situation when even the Army and the Paramilitary forces were failed to bring any peace to that region, our friends (but masters) like USA and UK still want us to shed more and more blood for the so called war on terror. It must be seen that Northern Areas of Pakistan cannot be controlled without gaining support of the local residents who are following a very old system which was helping them run their matters smoothly. Either we had introduced better education and legal system much before the crisis developed or we would have built some courage to accept their own system implemented in those areas with adjustments and improvements introduced with their consent. The present judicial system of the British era is totally parallel to Islam. Islam supports speedy trial and swift punishments to ensure the stability in law and order situation. It is now impossible to impose any other system in that area without consulting the local community of Swat and Northern Areas. Talibans at this particular point should show restraints and must exhibit their commitment that they are supporters of peace. People like Mehsud who feel no shame in killing innocent civilians inside Pakistan should be dealt with iron fist. Mehsud’s actions alone are hurting the face of Taliban. We have seen many attacks and suicide bombing incidences inside Pakistan and the responsibility of almost all have been accepted by Baitullah Mehsud and his accomplices. Besides all the pressure, it is extremely necessary that blood thirsty game should reach an end and people of the Frontier Province and Tribal Areas should be given fair chance to run the system they have chosen themselves with full confidence. It is seen very annoyingly that handful of parties like MQM in Karachi and some NGOs are initiating very dangerous propaganda to dismantle the deal in Swat. The videos of beating a girl and shooting a love couple have been found fake and could not be verified by any source. Ironically on the basis of these fake videos MQM tried to create a panic in the country and displayed its full muscle in its constituency to reject such kind of deals anywhere in Pakistan. Most amazingly MQM never knew that the system was running successfully in that region almost 10 years before but was forcefully replaced by conventional judicial system against the will of the local people of Swat and surrounding region. The hype and fear of Talibans moving to Karachi triggered by MQM is creating new crisis for the coming days. This negative propaganda is hurting Pasktun Community in particular who are engaged in earning their fair livelihood in Karachi since long. We can now smell that we are sitting on the tip of an active volcano. We all know that if forces who try to create problems for Pakistan fail at any front, they quickly shift their focus to Karachi to bring more unrest to this country. Every time the deteriorating law and order situation in Karachi hits badly to the stability of Pakistan because this biggest city of Pakistan is an important commercial and industrial hub, paralyzing it makes the whole country disturbed. It can be clearly seen that the peace of Karachi is now being made difficult to maintain by crossfire of words and arms between ANP and MQM and increasing tensions to an alarming level. One cannot declare only MQM responsible for this deadly situation in Karachi but ANP can also be prosecuted for their actions against the sovereignty of Pakistan inside this city. The continuous cry of Taliban’s presence in Karachi is hurting many Pakhtoons who are living here since decades and have businesses and trades well established and meeting the hard working strong labors requirement of this city. ANP is gathering many Pakhtoons who fear that if they will be categorized as Taliban and they will also see the bloodshed, the Drone attacks and the Army Action against them in Karachi too. ANP’s elements are also responsible to create havoc in the city. The present war front is Gulistana-e-Jauhar area and the tensions are also rising around the Sohrab Goth and Surjani Town areas in Karachi where the situation seems more like a new Beirut in the making. We can see gunmen of the rival parties moving freely with heavy arms on their shoulders and taking positions at the roof top of many apartments. ANP is allegedly capturing vacant apartments in many projects in the vicinity of Pehalwan Goth and Gulistan-e-Jauhar and illegally taking custody of many others by settling their activists and their families brought from the tribal areas. Many residential projects are now becoming war fronts of MQM and ANP. Rabia City, Own Apartments, Lakhani Apartments and vast area of PIA Society are visibly under extremely difficult situation. There is a very serious point to be noted that the Area of Pehalwan Goth is extremely close to the only International Airport in Karachi. The growing confrontation between ANP, MQM, Talibans and Some Baloch factions is making that area an alarming risk for the national security. The writ of the Government is virtually zero in those areas. Most of the bandits, dacoits, terrorists are hiding in the houses inside this huge slum. Any operation in these areas is next to impossible because of extremely narrow streets and huge population of poor people settled there including a considerably big community of Christians too. The main concern is the security of the only International Airport of Karachi which is under nose of suspicious people who could create an unavoidable situation in the near future. One can find that these elements have taken positions over the roof of different apartments surrounding the Airport and may any time cause terrible loss to the Airport or the Passenger Aircrafts standing on the Runway or even flying over these apartments. It is extremely necessary that the surrounding areas of the Airport should be vacated and the residents would be given alternate residences. Similarly the Kacchi Abaadis (slum Colonies) around Sohrab Goth Area are also becoming a high security risk. Slums like Sikandar Goth, Afghan Basti and similar colonies around Super Highway are extremely dangerous localities now. 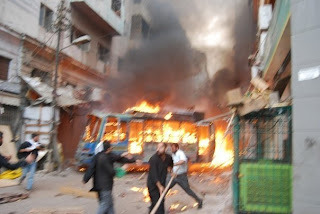 It is ironic that localities like Sikandar Goth were ordered to be vacated and demolised by the Sindh High Court but when Government tried to vacate that legally but the illegal occupants went on with violent protest and huge firing which caused death of many Civilians in the year 2006. Presently MQM is seeing every Pakhtun with a single eye, the eye which sees them as a Taliban. 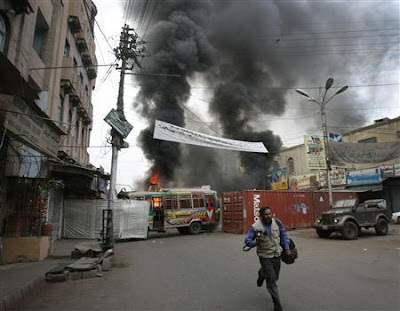 The recent unrest in Karachi especially in the Orangi Town area of Karachi, showed ill preparedness and lack of leadership from MQM’s side when the huge population of their supporters in that region, was thrown helplessly in front of terrorists who were taking advantage of MQM Pakhtun clash!! Many still believe that MQM is deliberately taking the situation to the point of no return. Many Pakhtoons are shocked and are extremely worried about their future because MQM leadership is heading towards an extremely deadly face off. Today it must be seen very closely that the timing of these actions is extremely dangerous. Pakistan is under pressure in Balochistan region especially after killing of three political leaders of Balochistan’s popular nationalist parties. The recent statement of former Prime Minister Mr. Nawaz Sharif indicates the intensity of the problem when he revealed that hatred against Pakistan is at its peak inside Balochistan. At the time when Pakistan is completely surrounded by enemies both from inside and outside working on the bloody agenda to initiate a final blow to our sovereignty and integrity the attitude of MQM shows a different story. It is quite clear that the task has been given to many of the anti Pakistan forces inside this country to create such an atmosphere when people would themselves begin to hate their motherland. Those who love Pakistan should see with their eyes that now many separatist groups are getting foothold in the past few months. We see an alarming uprising inside Balochistan and those controlling Karachi are also dreaming for their share of cake and have displayed their designs to expel rival ethnic groups from the city on the charge of being accomplices of Taliban. The game is on, but our eyes should be able to see the board which is telling a horrible story. Presently besides all the allegations and criticism I am seeing that the Government of Pakistan Peoples Party is fully capable to handle the situation. I must say that President Zardari and Prime Minister Gilani’s continuous positive efforts have silenced many critics like me. The ruling party met some tough phases during a very short period and handled them eventually according to the will of the nation. It must be lauded that those matters were not easy to handle which they were facing since coming into power. Prime Minister Yousuf Raza Gilani is coming out as a clean entity and his approach looks positive in handling the key issues. People of Pakistan are now seeing Mr. Gilani as a glimpse of hope and I must say that if our Prime Minister would be able to handle the issues of Balochistan, Swat and now Karachi, he will be remembered as the most successful Prime Minister in the history of Pakistan. PM’s team in the Cabinet is also seen as quite capable especially when we look at the Foreign Minister and now the well patient Mr. Kaira the Information Minister. PPP Leadership and Mr. Zardari in particular can gain huge respect and honor from the nation if they will be able to handle the alarming issue of growing unrest in Karachi due to dirty designs of those parties who want to gain their peace of land out of a country already tumbling due to enormous pressures from inside and outside its territory. We have to see also the current development due to shifting of American support towards Nawaz Sharif. It is a shame for the nation that our ex Prime Minister is praising Barrack Obama besides knowing that after his coming into power, the problems for Pakistan are multiplying even more faster that we experienced in George Bush’s era. It is extremely hard to find a face of a person who would be sincere and loyal to this beloved motherland “Pakistan”. It is bad luck for Pakistan that sincere people are now very rare to find. Only Allah can save us now because our own sins have made us see what we are experiencing now. May Allah Forgive us and Help this nation to come out of present traumatic situation. Ameen! !